Here we are in lovely deep summer and pluots have this way of pure delight. 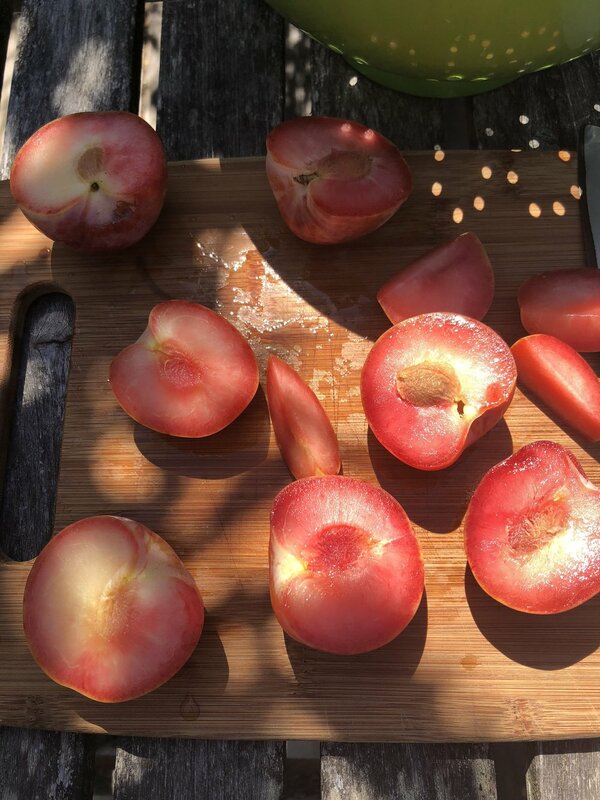 Roasting pluots with sugar until they just sort of fall apart and take on an incredible rich ruby color is delicious on toast, ice cream and well for this club, cake. I have a light cake planned around these pluots so that the fruit really takes the lead. Call your friends and invite them over for cake, cause it's summer. The Kebabery is extra lovely on a summer night with the door and windows wide open, the sun slowly setting through the pink sign and slipping over the signs and sides of houses across the street. That's where I'll be with cake on August 5th from 5-until sellout, where you can enjoy kebabs and then get a slice of pluot cake. You can also email me to reserve a whole cake (6"+$35). Hope to see you there cake clubbers.